Inspired by Country Living, a fashionable new magazine celebrating the rural idyll, (and, I suspect, largely read by townies)we decided not long after our move that we ought to go the whole, er, hog, and keep chickens. Both working full-time, it wasn’t exactly The Good Life, as popularised on telly the previous decade by the iconic sitcom featuring Tom Good (Richard Briers) and his ditsy wife Barbara (Felicity Kendall), but it was about as close as we were going to get, while both working full time in Bristol, 20 miles away. The following article, about our first ever chickens, kicked off a series of regular pieces that I started writing on a freelance basis for the more earthy publication, Country Garden and Smallholding, read by those who at least didn’t mind getting their hands dirty. It was the taste of a fried egg one lunchtime that made me acquiesce at last to my husband’s long-held ambition to keep a few chickens in our large country garden. Or rather, the realisation, as I chewed it, that the supermarket-bought egg tasted of absolutely nothing. My husband favoured free range methods, but having just spent three years transforming a wilderness into a kitchen garden, I was reluctant. “They prefer slugs to plants,” he was still saying some months later, rather unconvincingly as our new feathered residents were making a bee-line for my tender broccoli seedlings. However, before we could even consider inviting hens into our lives, we had to prepare safe and comfortable housing for them. We could, of course, have bought a ready-made wooden ark, for a hundred pounds or so, but we preferred to put to constructive use one of the small stone outhouses that was otherwise serving only as a dumping ground for flowerpots. We chose the one that seemed to have started life as a pigsty and my husband and father set to work to convert it into a henhouse. A simple roof repair and chicken wire job turned into a major renovation. A completely new roof and mains electricity were installed, (so that artificial light would fool them into laying eggs throughout the winter), and the bottom of the run was sunk deep into concrete, to be fox-proof. The inside walls were rough plastered, to make them less receptive to parasites, but it took the join efforts of my father and I to restrain my husband from emulsioning it just to make it more homely for the hens. “This isn’t a henhouse, it’s a luxury hotel!” remarked a neighbour wryly. With the work finally completed, we thought it would be simple to acquire a few hens. After all, we lived in the country, didn’t we? We visited the Domestic Fowl Trust at Evesham – a wonderful place, with hundreds of breeds and hens in all shapes and colours. Having taken several hours there to choose our favourites, we discovered that they would have to be hatched to order, and so we’d have a long wait for egg-laying hens. We’d also have to pay a great deal more than we could now afford, having rashly spent so much on the new henhouse. “There’s a catch! They must be battery hens,” I cautioned my husband. He was not convinced. I reserved my judgement and reflected that at £1.50 apiece, a mistake would not be expensive. We drove the next day to the farmhouse, which had outside a large sign detailing “farm-fresh eggs” for sale. My heart sank – this was code for battery eggs, I remembered. We parked in a yard edged by the farmhouse and a long dark shed. As soon as we stopped, we were aware of a constant clucking and cackling, emanating from the shed. A small door was the only entrance or source of light, and we stepped inside. Four rows of small wire cages, stacked four high and back-to-back, crammed as many hens as possible into the space available. Rolls of polythene sheeting beneath each “floor” of cages allowed the droppings to be rolled out without too much bother, while drainpipes along the front held water, a sparse ration of pelleted food, and eggs that had rolled out of the trap doors at the bottom of each cage. We seemed to have happened upon the hens in the midst of a riot, their featherless necks rubbing against the wire as they looked about them, clucking indignantly. “I’m getting back in the car,” I said. I’d suddenly gone right off eggs. At that point, the lady of the house entered the yard, followed by a small cheerful spaniel. She put them in cardboard boxes tied with a single string. Knowing how mad our cats go in transit, I had visions of driving home in clouds of feathers as they made circuits of the car. To my surprise, we just heard the odd confused cluck. When we got them home, we began to realise why. We took the chickens out of the boxes and stood them in the henhouse. We stood back, expecting them to start exploring their new home. The chickens stood still. We picked one up and moved it to a different place. It stood still. It dawned on us slowly that they didn’t know that there was any other option. They’d not been able to move about before, and so it did not occur to them as an option now. We were therefore amazed to discover that within five minutes one of them worked out that it was no longer bounded by a cage. Gingerly, it took a step forwards and, plucking up all its courage, pecked at the ground. Within a few minutes, the others began to follow suit. To see them become aware of their freedom was a great delight. For the first day and night we kept them in the henhouse. We thought this might seem stifling to them, but there was so much novelty. Sawdust to scratch in, a big plastic seed tray full of food, a washing up bowl full of drinking water, a tray of grit, all freely available – plus of course nestboxes and a perch, which they had never before seen. My husband decided to teach them to perch. He put them all in turn on the wooden perch he’d carefully fashioned. We waited. Then – thump, thump, thump, thump, thump, thump. In turn, they all fell off! However, the act of falling alerted their instincts to flap their wings – something else they hadn’t been able to do before. Watching an ex-battery chicken stretch its wings for the first time is a sight full of vicarious bliss. He also introduced them to the nestboxes, and our delight was unbounded at finding three large eggs there next day. We soon realised that the chickens preferred to sleep in the nestboxes rather than on the perch. They liked to huddle together in them, perhaps preferring the security of the nextbox walls to the exposure of the perch. The next day we left them out into the fixed run. They were shy of the sunlight at first but didn’t take much persuasion to emerge from the pophole. We fed them lots of weeds, especially dandelion leaves which they adored, but discovered that nettles, recommended by the books, were left untouched. My husband has also made a movable run to allow them to range on grass or soil. (His excuse for getting chickens in the first place was to enable us to control our slug problem organically.) We were pleased to see how thoroughly they dug over a plot of ground, but we have yet to teach them to differentiate between our ‘friends’, such as worms, and our ‘enemies’, the slugs. We have even found a chicken with a frog in it sbeak, whereupon we gave the hen a lecture about frogs being their colleagues on slug patrol, not their dinner! We were anxious as to how the chickens would react to our cats. We were very conscious that our seasoned birdstalking cats, who have been known to steal drumsticks from neighbours’ barbecues, might mistake the henhouse for their very own larder. We need not have feared for the hens – the cats were the ones that needed rescuing! When the hens first took up residence, our two littlest cats, Mabel and Dolly, spent hours with their noses pressed up against the wire of the run. There were fascinated by the jerky movements of the hens, who would occasionally acknowledge the cats’ presence by pecking their noses through the wire. When we allow the hens to free-range as a treat (under our strict supervision), the cats follow them, but after the odd initial skirmish the chickens have established their superior status and they will chase the cats away if they get too close. It makes a refreshing change to see a big bird flapping down the garden in pursuit of a cat! The hens are now producing an average of three eggs per day, and sometimes as many as five, which we are told is very good for yearlings. 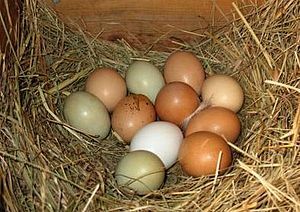 The eggs are large and a dark flesh colour, and some are so huge they will not fit into a standard size egg box. We were very proud recently when a carefully selected half-dozen took third prize in our annual village show. We also benefit from their manure, which long with the sawdust from the henhouse has topped up the compost heaps to capacity – the only problem being that we feed virtually all the weeds to them, so the green element of the compost heap has been reduced, other than nettles of which there are still plenty. Perhaps next year we will also be able to produce champion beans – a crop which apparently dotes on chicken manure. In return for this bounty, we provide a handful of layers’ pellets to each chicken per day, with a little oystershell to avoid soft-shelled eggs. We throw down a few handfuls of grain for them to scratch for and a lot of kitchen scraps. In colder weather we give them a dish of layers’ mash, mixed with warm water to form a porridge. They also help us to take care of gluts of garden produce that we cannot preserve. We were delighted to find they even like the cucumbers that we had accidentally allowed to turn bitter on the plant. Raiding the larder for special treats (not that they need them), my husband will give them tinned corn, baked beans, tinned tomatoes and sultanas. Consequently if they seem him with a plate in his hand, they will follow him anywhere (even into the kitchen!) – very handy for persuading them to return to their house after a free-range session. The books are right when they say ten minutes care a day, plus half an hour to clean them out once a week, is sufficient. But we spend a lot more time with them because we find them soothing, entertaining and undemanding companions who soon take away the stresses of the day. They are also very popular with our friends. When we go away, we have no shortage of volunteers to look after them, especially when we say they can keep any eggs they find. And what of the eggs’ taste? Well, of course, it’s absolutely delicious!